Consumers and businesses want better, faster cross-border payments options. Real-time 24x7 services are in demand everywhere, and cross-border is no exception. But traditional correspondent banking is slow, expensive and opaque. Banks must improve their cross-border services. Alternative cross-border mechanisms–SWIFT gpi, Ripple, Earthport and others-are rapidly gaining traction. If banks do not modernize their legacy services, competitors will close the gap. VolPay Cross-Border Payments allows banks to realize the opportunities of this fast-growing market, by accessing the full range of cross-border payment clearing and settlement mechanisms, traditional and next-generation. One solution for all your cross-border payment clearing and settlement needs, from traditional SWIFT correspondent payments to alternative mechanisms. Watch the video to understand the importance of SWIFT gpi, the technical challenges are around implementing SWIFT gpi, and how Volante can help address these challenges. The combination of Volante and Ripple greatly simplifies banks' integration with Ripple distributed financial technologies. 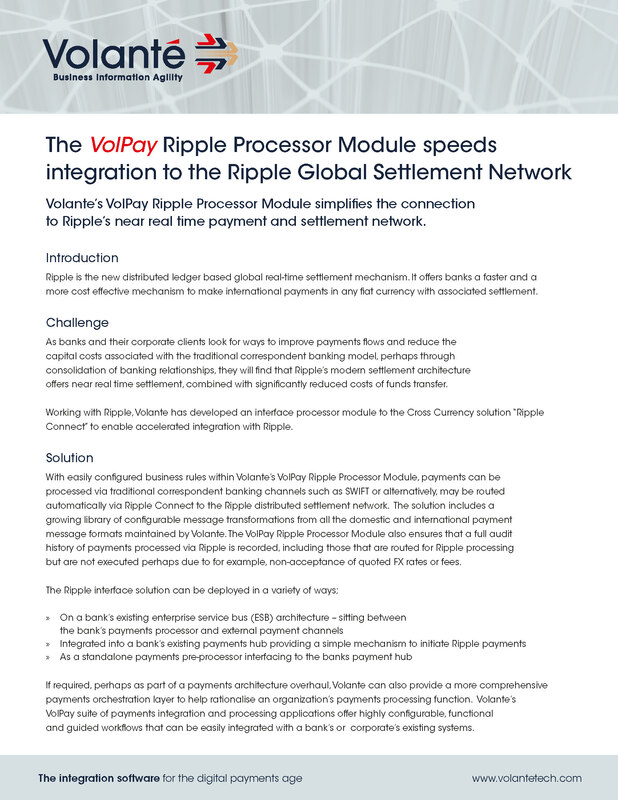 We view Volante as a critical partner for building Ripple's new real-time, data-rich payments network.